Located 24 miles north-west of Birmingham and about 16 miles north of Wolverhampton, Stafford the county town of Staffordshire is place conveniently on the M6. The town is one of the smaller towns in west-midlands but is full of life and highly populate for its covered area. 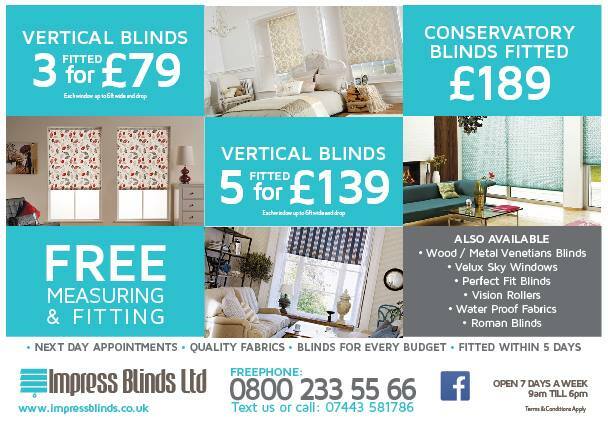 Impress Blinds cover most of West Midlands with our high quality windows blinds services and the town of Stafford is one of our most preferred service areas. Whether you want a professional window and wall look for your commercial or office based interiors or you want perfect domestic windows blinds in unique colors, designs, patterns and styles, Impress Blinds has got you covered. We offer many different materials, shapes and styles of Cheap Window Blinds that provide styling and window covering in many different ways that bring beautiful elegance combined with required functionality on your walls and windows in Stafford. Impress Blinds has a wide variety of windows blinds including our day perfect Vision Blinds (Visionary Blinds) that provide filtered glare-free daylight and their own unique perforated patterns while staying down on your windows, the Conservatory Blinds that are made specially for conservatory windows and doors, Cheap Roller Blinds that cover the entirety of your windows with their composite printable materials when rolled down, uniquely designed Vertical Blinds that support privacy and any kind of usage or other high quality types of windows blinds including the fabric Roman Blinds, Cheap and Elegant Wooden Blinds, Metal Venetians or fully shutting Velux or Shutter Blinds. Choose the ones that suit your design preferences perfectly and we will deliver you finished window blinds in Stafford that will provide that ‘Wow Factor’ for your windows or walls. Making your windows and walls look good is all about adding unique colors, elegant patterns and beautiful textures and designs. Impress Blinds in Stafford offers some of the most elegantly designed Roman Blinds and Roller Blinds that can be design printed with any required patterns or textures complementing your plain painted walls beautifully. Our perfect Metal Venetians are also available in any required color combinations and surface finish options bringing colorful charm to your windows. With the Roman or roller blinds, you can also create thematic designs for your walls continuing the designs on your windows with perfectly printed blinds that cover the wall as well as provide a full view of the theme design they have printed on them when down shut. Impress Blinds keeps all kinds of interior designs in mind when offering our high quality windows blinds. You can complement your wooden themed interiors with our perfect Wooden Blinds or go the fabric way in rooms where fabrics are found in abundance with perfect Roman Blinds. Check out our collection of Metal Venetians for rooms where matte or shiny designs occupy walls, floors or furniture or even go completely unique with Vertical Blind’s composite materials. Any materials oriented design themes you may have in your interior settings, Impress Blinds can complement it with our perfectly designed windows blinds at much affordable prices. Our major clients in Stafford are much satisfied with our services.